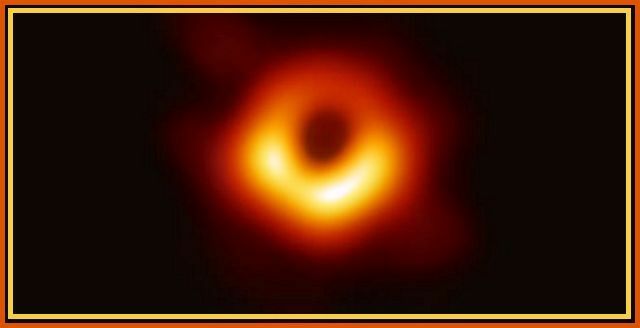 Astronomers took the first ever image of a black hole located in a distant galaxy on April 10, 2019. The image was captured by the Event Horizon Telescope (EHT), a network of eight linked telescopes. Until now, every image of a black hole has been an artist's impression. The ‘Event Horizon Telescope’ (EHT) project began in 2012 to observe the immediate environment of a black hole using a global network of telescopes. The project targeted two supermassive black holes residing at the center of different galaxies. The researchers carrying out the project obtained the first set of data in April 2017 using telescopes in the US states of Arizona and Hawaii as well as in Mexico, Chile, Spain and Antarctica. Later, telescopes in France and Greenland were added to the global network that created a planet-sized observational dish. What does the image reveal? The image shows a supermassive black hole at the centre of M87, a neighbouring galaxy to Milky Way. The black hole measures 40 billion km across and has been described by scientists as "a monster". The image shows the boundary between light and dark around a black hole, called the event horizon. This horizon is the point of no return where the gravity of the black hole becomes so extreme that things that enter can ever escape. It is located more than 55 million light-years from Earth and is estimated to have a light-sucking core 6.5 billion times more the mass of the sun. The historic image of the Black hole matches so closely to the predictions, hence confirming the Albert Einstein's Theory of General Relativity. The Einstein's Theory of General Relativity was put forward in 1915 to explain the laws of gravity and their relation to other natural forces. It allows scientists to predict the size and shape of a black hole. Black holes are objects so dense that no matter and not even light can escape their gravity, and since nothing can travel faster than light, nothing can escape from inside a black hole, making them extraordinarily difficult to observe. However, a black hole exerts the same force on something far away from it as any other object of the same mass would. Black holes are of different sizes and are formed when very massive stars collapse at the end of their life cycle. Black holes can be small like an atom, or big like a large mountain. A black hole's horizon is the point of no return beyond which stars, planets, gas, dust and all forms of electromagnetic radiation get swallowed into oblivion. There are basically three types of black holes: stellar, supermassive, and miniature black holes. Stellar black holes are formed when a massive star collapses. Supermassive black holes are equivalent to billions of suns, and expected to exist in the centres of most galaxies, including Milky Way galaxy. Miniature black holes are assumed to have been formed shortly after the “Big Bang”, which is predicted to have started the universe 13.7 billion years ago. The four day long joint training focused on developing interoperability and conduct of joint tactical operations in mechanised warfare. The troops of both the nations learnt about each other’s organisations and best practices being followed in combat. The exercise began on April 8, 2019. The exercise began after a colourful inaugural ceremony. The exercise was conducted with an aim to develop military technology, boost maritime security and bolster the nations’ fight against terrorism. The exercise was also aimed at attaining a high level of interoperability between the armies of both the nations through mutual understanding and familiarisation with each other’s operational procedures and equipment. India and Singapore had signed a cooperation agreement in November 2017 to strengthen the defence ties between Indian Military and Singapore Armed Forces. As per the agreement, the Singapore military would undergo training and participate in firing exercise with Indian counterpart. Next Story Is Online Voting allowed in Indian General Elections 2019?